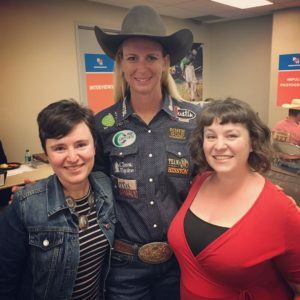 Megan Cohen and I interviewed four-time World Champion barrel racer, Sherry Cervi, backstage at RODEOHOUSTON. I had the great pleasure of spending last week doing immersive field research in Houston, Texas with my librettist collaborator (and sister) Megan Cohen. We’re in the early stages of developing a “feminist rodeo opera” commissioned by Houston Grand Opera’s HGOco for their wonderful Song of Houston chamber opera initiative. Set at the present-day Houston Livestock Show and Rodeo, this opera’s fictional story focuses on women in rodeo culture. Our characters include a professional barrel racer, a CEO of a Western wear company, a rodeo queen, and the ghost of a 19th century cowboy. Thanks to Houston Grand Opera’s HGOco, and the Houston Livestock Show and Rodeo, our research activities included interviews with seven amazing rodeo athletes (including World Champion barrel racers! ); site visits to George Ranch, The Heritage Society, and the Hispanic Chamber of Commerce Women’s Leadership Conference; and, of course, plenty of exploring and observing the rodeo itself. Check out my Twitter and Instagram feed (#RodeoOpera) for photos and summaries of our experiences throughout the week! The premiere production of our opera is scheduled for Spring 2021. I can’t wait to share it with you.